We know past giving’s role in predicting future giving because we have back tested our predictive models against $5 billion in known giving. That $5 billion came from 2 million donors to 400 fundraising organizations. A donor who has made a gift of $100k+ to a nonprofit organization is 32 times as likely to donate charitably as an average person is. A donor who has made a gift between $50k – $100k to a nonprofit organization is 25 times as likely to donate charitably as an average person is. A donor who has made a gift between $10k – $25k to a nonprofit organization is 10 times as likely to donate charitably as an average person is. A donor who has made a gift between $5k – $10k to a nonprofit organization is 5 times as likely to donate charitably as an average person is. These convincing numbers come from our proprietary charitable giving database. See how DonorSearch can maximize charitable giving data. 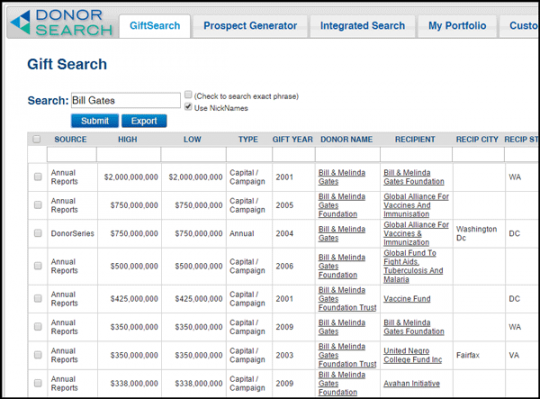 What is DonorSearch’s charitable giving database? Thanks for asking. Let me tell you! Our charitable giving database is one of the fastest growing and largest databases of philanthropy in the country. 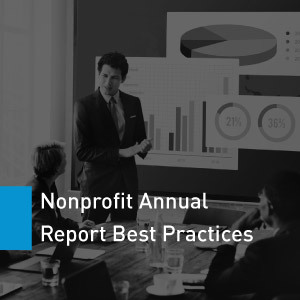 Annual reports curated from a bevy of nonprofit websites. Print references that are otherwise challenging to uncover. 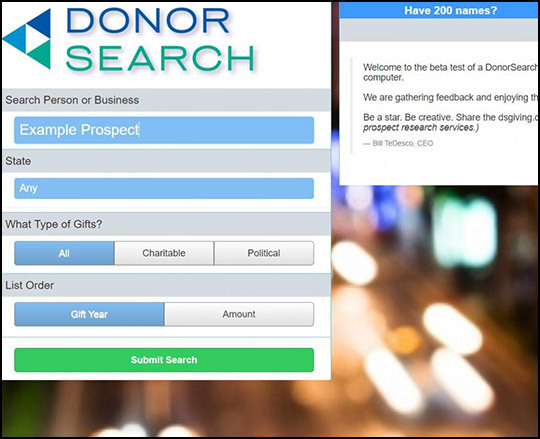 DonorSearch collects charitable giving data on major donations, listing key information like the donor, source, donation amount, type of donation, year the gift was given, and organization that received the gift. With our charitable giving database, organizations can search for key potential contributors to learn more about that donor’s giving behavior. Additionally, the charitable giving database features plenty of details that were once publicly available on the internet and have since been removed. In other words, the philanthropy database is filled with information you won’t find elsewhere. Learn more about our data. What are the important statistics regarding DonorSearch’s charitable giving database? A growth rate of 500,000-700,000 records per week. 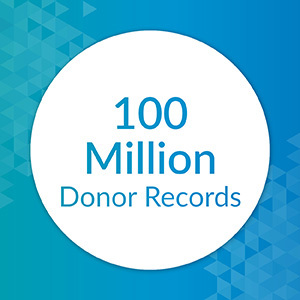 With that many gift records in one place and the numbers only growing, we have the resources to give you the data you need to make informed and strategic plans for cultivating new donors. These records tell you a prospect’s giving history, which is the most important piece of prospect research a fundraiser can have. 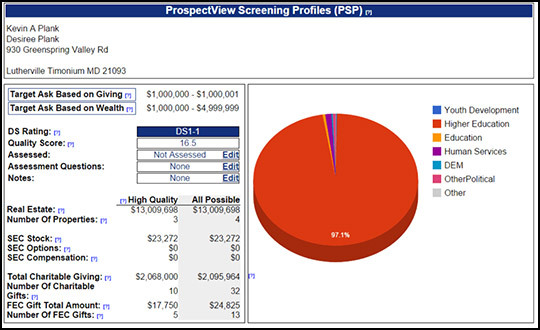 Learn more about the benefits of prospect screening. How do you use the charitable giving database? We also provide donors with our free DS Giving search tool. This tool allows nonprofits to search for a person or business, filtering by state and type of gift. The DS Giving search tool gives organizations a full profile of the prospect along with recent charitable donations. Prospect research gives you the information you need to succeed when cultivating your donors, so start your search with charitable giving and work your way to other topics like business affiliations and stock ownership. Learn more about our diverse section of databases. 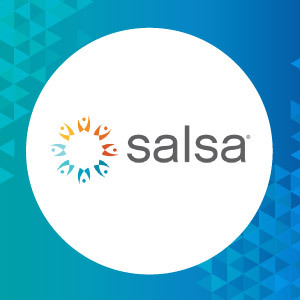 Your donors’ information is secure and organized with Salsa. Plus, you can even integrate DonorSearch to take your donor management to the next level. 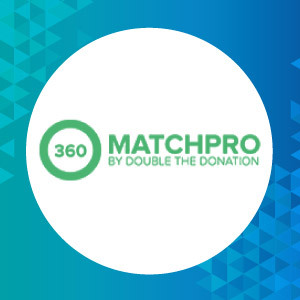 You’ll be able to instantly identify matching gift donors when they donate with their corporate emails and trigger automated emails to send them! 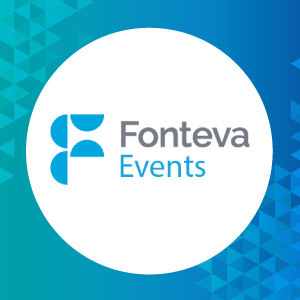 In addition, it’s built on Salesforce for flawless integration to your existing software, making Fonteva Events even easier to use. Is your organization interested in using charitable giving data to identify major donors? 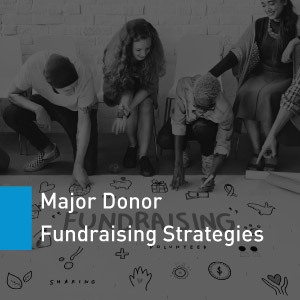 In our article about major donor fundraising strategies, we provide tips to help you perform prospect research, contact potential supporters, and so much more. Keep reading to learn how your organization can pinpoint major donors! Check out our 11 major donor fundraising strategies! Did you know that next to major gifts, planned gifts are some of the biggest donations an organization will receive? Learn this and many more helpful details about planned giving to help boost your organization’s fundraising potential. With our guide you can brush up on planned giving basics and learn a few tips to improve your strategy! 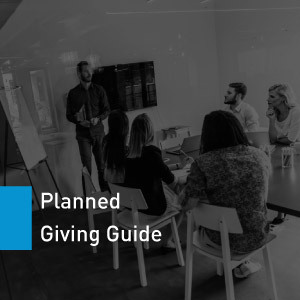 Check out our complete guide to planned giving! An annual report details your organization’s accomplishments and can be used as a tool to cultivate relationships with major donors. Plus, the information you compile into your report helps fill DonorSearch’s charitable giving database with more useful information. Learn more about the benefits of annual reports and get inspired by our amazing examples! Check out our annual report best practices! Contact us to learn more about how to be featured on the DonorSearch blog!